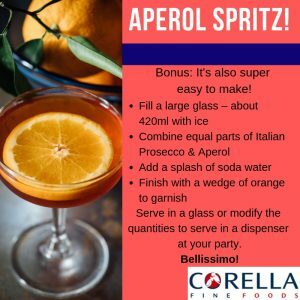 Aperol Spritz is a light Italian cocktail. Aperol’s blend of 16 ingredients, including bitter orange, gentian, rhubarb and an array of botanicals give a unique orange colour and bittersweet taste. 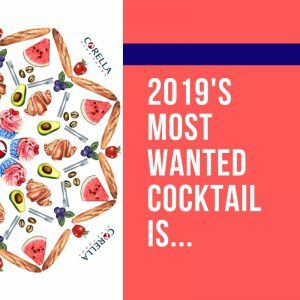 This cocktail has been in high demand for so many of our functions and events so far this year, whether served in an individual glass or dispenser, it’s a refreshing accompaniment to our canape menus. Incorporate a cocktail dispenser into one of Corella’s styled bar stations as a feature for your event, to accompany your chosen menu. 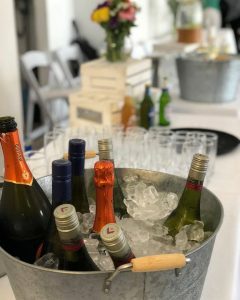 We know what’s on trend when it comes to catering and event styling and will happily assist you in planning and executing the perfect event no matter what you are planning – be it a wedding, corporate event, birthday party, high tea, kids party & more… if you can dream it, we can achieve it! To start planning your catering, call us on 02 9999 6222 or email sales@corellacatering.com.au, we’d love to hear from you.